Italy is well served by many kind of means of transport: plane, train, bus and taxi. - availability of private means of transport with or without driver for the whole length of your stay. Most of these services are especially dedicated to people with disability. In Florence, Tuscany, Rome, Venice, Milan, Naples, Como, Verona, we enjoy collaboration with private accessible means of transport rental companies, and are able to arrange accessible services for you, depending on your needs, because our goal is to meet all your requirements! 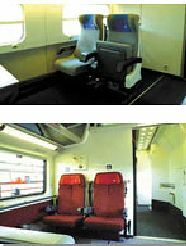 Accessible Italy Dept furnishes accessible train seats booking. Not all Italian trains are accessible, so we provide assistance helping you to find the best train time-table and itinerary. The access to the carriage is through an elevator, shunted by the ground assistance that we will require at each train station for you. *Carriages equipped with wheelchaired-user travellers on train of medium and long journey. 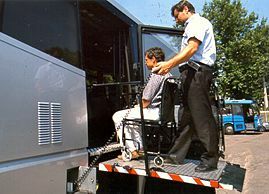 Carriages equipped with wheelchaired-user travellers on train of medium and long journey, are equipped for two passengers wheelchair users and two companions. This area is furnished with accessible toilet and a wide area with wide window and accessories. The client using a manual and folding wheelchair, who can move to a standard seat, can use ordinary seats in ordinary carriages and we will also provide ordinary seats booking. There are no special train fare for tourists, but only for residents in Italy. 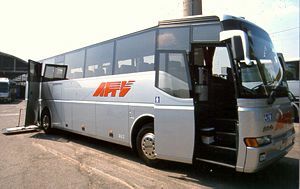 Accessible Italy Dept provides accessible vehicles that can bring a maximum of 3 wheelchair users + 3 able-bodied + luggage. The standard minivan is equipped with an electroidraulic posterior ramp to let the wheelchairs go into it. On the van floor a safety-bolt fixes the wheelchair. The back door is manual. This minivan is usually hired with an English speaking driver. It can also be hired without driver in Udine with possibility of delivery and collection in Venice, Florence or Milan. Each request is taken into account and need a specific estimation. The service is available on holidays and at night and it can be used for excursions, outings and journeys abroad.